ZHU ZHU HAMSTER FUN! 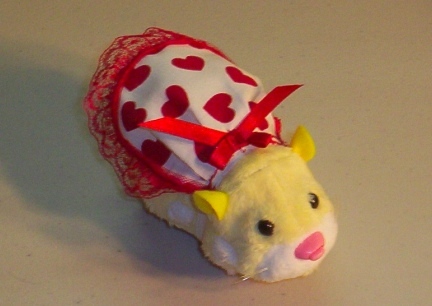 This is a cute little St. Valentine's Day Dress will be adorable on your pet, it will stay on with the elastic, even when your Zhu Zhu Hamster is in motion. This item stays on the Zhu Zhu Hamster, even while in motion, with elastic. DRESS UP YOUR ZHU ZHU HAMSTER. THESE ITEMS ARE UNIQUE AND EACH HAND MADE IN OUR NON SMOKING NW SD HOME. All of the designs are our own here at Marna's Menagerie. PLEASE NOTE: YOU ARE BUYING THE DRESS ONLY. ZHU ZHU HAMSTERS NOT INCLUDED. Items may vary slightly. YOU ONLY PAY SHIPPING ONCE OR FOR ONE ITEM. NO MATTER HOW MANY ITEMS YOU PURCHASE THEY WILL ALL SHIP FOR THE PRICE OF THE HEAVIEST ITEM YOU CHOOSE.